Lulav and etrog are used each morning from the beginning of Sukkot through the morning of Hoshana Rabba, but not including Shabbat. To order a lulav and etrog contact the office at office@beki.org. 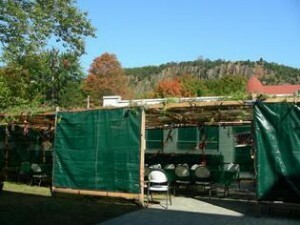 Some services, and qiddush for the Festival days and Shabbat, are held in the sukka, weather permitting. Please dress accordingly. During Ḥol HaMoed and Hoshana Rabba (except on Shabbat), some wear tefillin until Hallel is begun; others do not wear tefillin during this period. The general practice at BEKI is to not wear tefillin. The BEKI Moishe Schnitman Sukka is open for use to members and their guests, supporters and neighbors; no representation is made by the synagogue concerning the kashrut of food brought by members and their guests, supporters and neighbors for personal use in the sukka. See Calendar or Upcoming Events for annual events such as Sukka Hop and organized Dinners (Pizza or BBQ). Hear the blessings for festival meals. For a Hebrew Calendar Add-on with candle lighting times for Mozilla Firefox, see https://addons.mozilla.org/en-US/firefox/addon/1379. Want to know who is scheduled to lead the services? Consult the Service Leader Rotation Schedule to see who is doing what where on Shabbat Evenings, Mornings and Afternoons.